"Cheyenne Bottoms," five miles northeast of Great Bend, Kansas, in the center of the state, is a natural 22,000-acre wetland that has been "stabilized" to maintain consistent water-levels for duck and goose reproduction and for hunting. 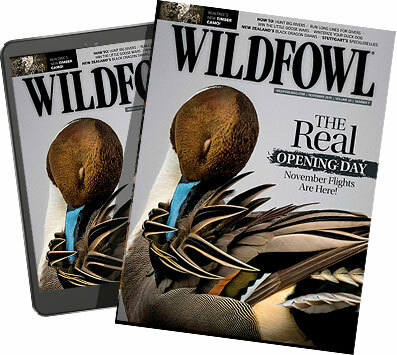 "On a day like this, with blue sky, 40-degree temperatures, and no wind, we'll probably shoot green-winged teal, some wigeons, a few gadwalls and maybe a couple of Canadas," Mike Perry forewarned us. "To consistently get late-season mallards and Canadas in Cheyenne Bottoms, we almost always need 'nasty' weather," he added as we loaded up his 14-foot boat and he fired up it's mud motor. The big 25-horsepower motor pushed the 15-foot aluminum boat down a quarter-mile long, man-made canal that led straight into a natural 13,000-acre marsh with 25- to 50-acre patches of open water, small clumps of cattails, and plenty of boot-sucking mud about 10 inches below the water's surface. Perry aimed the boat into the fading night and 15 minutes later we glided to a stop in the middle of his decoy set. There his brother Jason had just finished setting out three-dozen floater Canada's and five-dozen lightweight mallards. After pushing the boat into a stand of cattails, we pulled up and into position a quick-set blind, then sat back to wait for sunrise. With the December sun slowly peeking above a distant cloud bank behind us and the decoys gently bobbing in a slight breeze, we began to see the vast expanse of the world famous Cheyenne Bottoms Wetlands. The "Bottoms," as it is called in this part of central Kansas, was formed 10 million years ago when Mother Nature for some mysterious reason caused 42,000 acres of the otherwise pool-table flat Kansas landscape to suddenly sink. The drop in the earth's crust was just enough to make a depression into which the surrounding watershed flowed to create a wetland that has ever since been a magnet to all species of waterfowl in the Central Flyway. And despite some threatening modern-day suggestions to drain the wetlands to make cornfields or to modify it for irrigation or flood control, this 42,000 acres of real estate still looks pretty much like it did millions of years ago. Today, the 12,000 acres of actual marsh have been "stabilized" by the Kansas Wildlife Department with a series of low-lying dikes and channels to create five major "pools," one of which is a 3,300-acre refuge. The remaining pools are managed for waterfowl production and are open to waterfowl hunting. Each of these pools has "access areas" with a place to park vehicles and to launch boats that usually can be motored or push-poled into thousands of acres of prime duck and goose hunting locations. Boat-less hunters can park here too and walk out to these places if they can handle a mile-long hike through mud and cattails. "From early October to late January, the refuge pool and the whole wetlands complex might attract up to a half-million ducks and geese. But the hunting always depends on the weather," Mike Perry said as we looked to the west for the first flicker of bird wings. A few unidentifiable ducks flew over in the fading darkness. As the sun finally inched over the horizon, I stood up to stretch and to comment: "This looks like a better day for bluebirds than for waterfowl." A system of low-lying dikes and canals are used on the Cheyenne Bottoms to maintain a system of five "pools," one of which is a waterfowl refuge. The other pools, all open to public hunting, are usually 8- to 20-inches deep and easily accessible for hunters in waders or boats. Saying this, along with pouring a cup of coffee or answering a call of nature, has always been one of my secret weapons to produce shooting action. This morning was no different. In mid-stretch, Mike said, "Get down. Ducks coming." From behind us, a flock of 15 big birds swooped overhead, then suddenly turned at Mike's highball call and brother Jason's feeding chuckle. "Mallards," I whispered as the sun lit up the greenheads on eight of the ducks as they cupped their wings over the decoys. Five seconds later four drakes were belly up in the water and "Buck," Mike's chocolate Lab, was chasing down the fifth. "That was a pleasant surprise," Mike said, as he stuffed more steel BB's into his shotgun and waited for Buck to deliver the wounded greenhead. Once back in the boat, Buck, like all Labs, gave the big shake that usually leaves everyone and everything soaking wet. But the usual downpour was only a fine mist because of the dog's neoprene vest. "Not only does the vest keep the dog warm in cold water but it keeps all of us a lot drier," Mike pointed out. "Where are those teal, wigeon and gadwall you talked about?" I asked Mike. Though certainly not disappointed to shoot mallards, I was eager to get some photos of the "mixed-bag" that Perry had told me was a common hunting experience throughout much of the season when hunting the Bottoms. "They'll be here," Mike said. "Just wait." Well, we waited. And more mallards came to the dekes so that by 10:30 that morning we were only a few birds short of a greenhead limit. With only one green-wing teal on the game strap, we packed up the decoys and headed back to the landing for an afternoon of field hunting Canada geese. An "Avery 'Quick-Set' Blind" and a 25-horsepower "Go-Devil Motor" are a good combination on an aluminum V-hull boat for waterfowl hunting just about anywhere on the various pools of the Cheyenne Bottoms. Canada honkers of the smaller and the giant variety abound in this region of Kansas because of the water and cattails of the Cheyenne Bottoms. "We have resident geese that will winter in this region of the state, resting in the 'Bottoms' on our refuge area and staying on the Quivira National Wildlife Refuge 25 miles southeast of here," Mike Perry told me. "As many as 150,000 Canada geese might be in the general area from November to February if the weather doesn't get to freezing temperatures and snow cover," he added as we set out our decoys in a field 15 minutes from Great Bend. "Weather 'too nice', however, can be a problem," Perry decided three hours later as we picked up the dekes. One big Canada and two smaller ones had suckered into the winter wheat field where plenty of goose tracks and droppings promised more birds than actually appeared. "When the weather is this summer-like, sometimes the geese will feed just once a day," Perry said. "Tomorrow might be different, according to the TV weather channel, with a big cold front moving in from the north. That's a pattern that stirs up the waterfowl just about everywhere around here," Perry assured us. That night the weather did one of those Midwest "quick changes" with warm south winds switching to the north and cold air from the arctic sweeping across the Kansas prairie. "This is the day we've been waiting for," Perry said the next morning as we boated down the Cheyenne Bottoms canal under a low overcast sky, a cold stiff wind now bouncing the decoys. "Today we should hammer some more mallards and probably will get into some good flights of honkers. Just wait and see." Well, we waited. And what we saw from sunrise to mid-morning was a regular flight of green-winged teal punctuated by many small flocks of wigeons, some gadwalls, several bunches of shovelers, and even one bull canvasback. "There's the ducks for your mixed-bag picture," Perry said as his Lab brought in the trophy canvasback. Mike Perry (right) and his brother Jason have hunted the Cheyenne Bottoms and the region around Great Bend, Kansas, all their lives. Their guiding service has been built on the promise to provide their clients access to all the available kinds of waterfowl and upland gamebirds in the area. "But where's all the geese?" I asked. Ten minutes later a flock of 20-some specklebellies came by high, wide, and well downwind of the decoys. Mike and his brother Jason both laid into their specklebelly calls." The whitefronts suddenly turned and then just hung there 200 yards high and 300 yards outside our decoy spread. "Jason, hand me the pole kite," Mike told his brother who had already picked up and stretched the collapsible "pole" to its full 16-foot length. While Mike worked the flag over the side of the blind, Jason continued the two- and four-part "laugh" of the speck on his call. Slowly the specks started to spiral down toward the decoys while Mike continued to work the kite in imitation of a goose as it flaps its wings just before landing. "Maybe they're looking for speck decoys," I whispered to Mike the third time the tiger-breasted geese swung 100 yards high and wide of our spread. Finally, two birds broke loose from the main flock, set their wings and glided 50 feet above the Canada dekes before they wised up and started to back pedal. "Take 'em," Mike said, and both geese folded up and splashed down in range of Mike's big Labrador. "Those specs sure were spooky," Jason later said. "I think we did the right thing, though, by getting two in hand rather than hoping for the whole flock to come in and maybe getting nothing. Anyhow, now you've got some geese for your mixed-species picture." From the wetlands of the Cheyenne Bottoms, we went to the uplands still within sight of the big marsh for an afternoon of pheasant and quail hunting. As the day progressed, however, the temperatures steadily dropped while the wind kicked up to a steady 20 miles per hour. By sundown we each had a pheasant and two quail and our fill of a face-numbing, 10-below-zero wind-chill. Even the dogs seemed glad to load up and head back to town. This big and fast weather change isn't unheard of in Kansas, though it's unusual even in early December. The best part of bad weather in this state, however, is that usually it doesn't last long, with cold air and snow on the ground usually disappears in a few days. "Most cold snaps come and go in a hurry," Mike Perry said, meaning that planning a late-season waterfowl hunt here is usually a safe bet. "I tell my hunters who come late in the season that we will most probably hunt open water in the Cheyenne Bottoms. But if the Bottoms ice over we can field hunt in cut corn or winter wheat for ducks and geese. And if for some reason that doesn't work out, we can always go pheasant and quail hunting," Perry added. "No matter what the weather conditions in this area, we almost always have Canada geese in this region of Kansas," Perry said. "From the opening day to the end of the season, in most years, the locally raised honkers staying here usually attract big flocks of migrating geese. Between the 3,330 acres of refuge on the Bottoms and the 8,000-acre 'no hunting zone' at the Quivira National Wildlife Refuge 25 miles southwest of Great Bend, there are plenty of places for honkers to rest undisturbed by hunters, and there are thousands of places for them to feed for miles in any direction." Mallard ducks and Canada geese are often the professed personal preference for some "late-season" waterfowlers who hunt the Cheyenne Bottoms and other wetlands in this central-Kansas region. Most hunters, however, are happy to bag a mixed species of teal, gadwalls, wigeon, redheads, canvasbacks and bluebills, as well as specklebellies and the occasional snow goose. Coming to this part of Kansas in December can certainly increase the odds on shooting greenheads and honkers but just as certainly doesn't leave out the other duck and goose species. "Hitting the 'Bottoms'" for waterfowl can lead to happy surprises just about any time of the season as many resident and non-resident waterfowlers who hunt here can testify. "We've driven out here from Indiana in early December for the last three seasons," two Hoosier state waterfowl hunters at a Great Bend restaurant said one evening. "This is the best time to come because there has always been lots of ducks and geese and hardly any other hunters. Most of the non-residents have come and gone by now and even many of the local hunters have given up for the year," the Indiana hunter added. "The first time we came to Cheyenne Bottoms we stayed for five days. But we sort of burned up half that time just figuring out where and how to hunt here. On that first trip, our best time was the last two days when we finally located some good spots and saw where to put the boat blind and decoys. Now we have a pretty good idea as to where to go and what to do, but a lot of what we know we learned the hard way," the hunter admitted. "Our biggest problem is dealing with the changes caused by water-level fluctuation. This year the ponds were lower than before so we couldn't run our outboard in many good places without plugging the motor up with mud. We spent most of the time taking long walks in waders and carrying heavy bags of decoys. "The personnel at the Cheyenne Bottoms headquarters can give some general information on the conditions at each pool at the complex. But things can sometimes change a lot from when we leave home and when we get here," the Indiana waterfowlers had discovered. "The same thing, of course, holds true for bird counts which can change by the hour depending on the weather. g to this part of Kansas for the first time? I guess I'd say that depends on how much time you have to hunt here and how much equipment you're willing to carry across country," the Indiana waterfowler said. "The local guides we know all live here, have boats, blinds, decoys, dogs, and the experience of hunting this area all season. For a few hundred dollars of expense, access to all this equipment and know-how may be worth the investment."